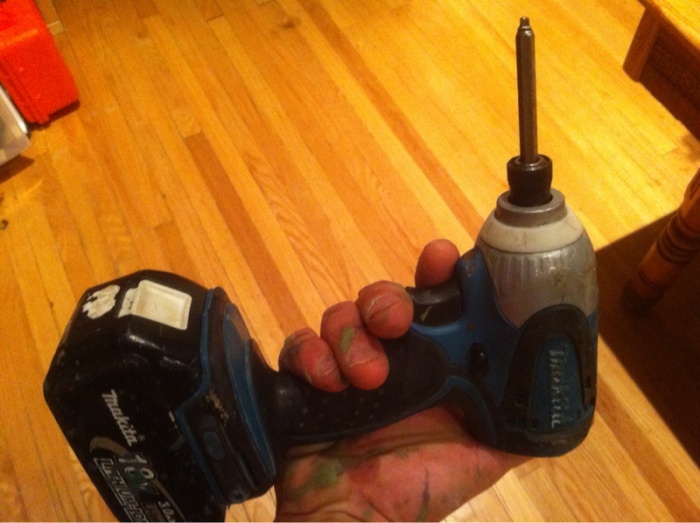 How much I love this Makita impact driver. But it is nice so far. It will sink 3 1/2 " treated screws into PT like its loafing. Why did I wait so long to buy this tool. The light is great for cabinets as well. Nice, I guess I'll pitch in with a pic of mine. 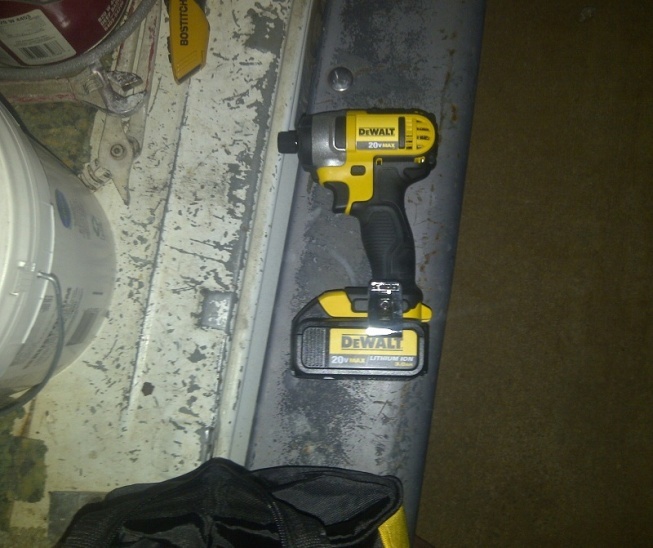 My dewalt Driver- I use it for taking down cabinet doors for spraying, hardware, etc..
Last edited by Gotdibz; 10-10-2011 at 08:24 PM.. Huge fan. Getting an impact is like one of those "why did I wait this long"? Moments. Last edited by Paint and Hammer; 10-10-2011 at 09:04 PM.. I know you don't have a square on yours? Insert pulling our hair .gif. There are plenty of others in the box, but this one was driving treated screws all morning in 2x8's. I would normally use torx but this was "I bought all these materials already. Can you use them up first please? What's 'torx'....can you get that in a screw head? IMO - the Robinson (square) is superior to Phillips or slotted, to bad the US didn't get on that bandwagon. Its also called star but it isn't the same. I have those bits, but have never seen the screws sold. 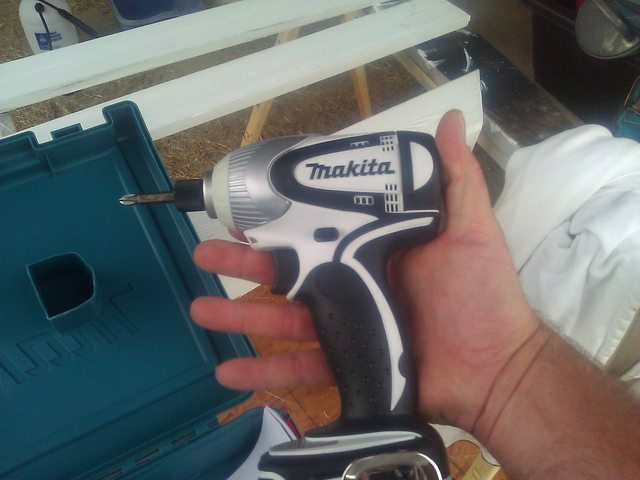 You'll love the drill...imo, Makita has the best weight to power ratio out there....you'll have that thing for years. I'm not exactly nice to my stuff and its been flawless....enjoy! You'll see a lot of the Torx fasteners used on the interiors of cars, dash and whatnot. I love star and square. oh and you'll burn up even more time contending with stripped phillip screws anyhow. Last edited by TJ Paint; 10-10-2011 at 11:45 PM..
-When extreme pressure is applied to a screw a flat - headed screw will take more torque before shearing off and breaking. -In an environment where the screw head might get clogged with dirt or paint, a slotted head is much easier to clean out. -I assume you're using the term flat head to mean slotted because flat head screws can be any type of drive but refer to the actual shape of the screw head itself. The only possible use for slotted screws is appearance, and that usually applies to decorative hardware in high end applications where you can align the slots, like on a jewelry box. Phillips and Robertson (square drive) screws can be tightened and loosened with power tools whereas slotted cannot and are much more susceptible to stripping. Any drive system that isn't slotted offers much more surface between the tool and the screw head. -. you can turn some with a dime or key or thumb nail. cross tip or Phillips normally require a specific tool. -The thing is, Phillips are actually designed to strip out easily. They were invented to make automated car assembly easier, as torque limiters were not yet common. The driver would turn until the head stripped, and that would be that; no worrying about turning too far and damaging the frame. 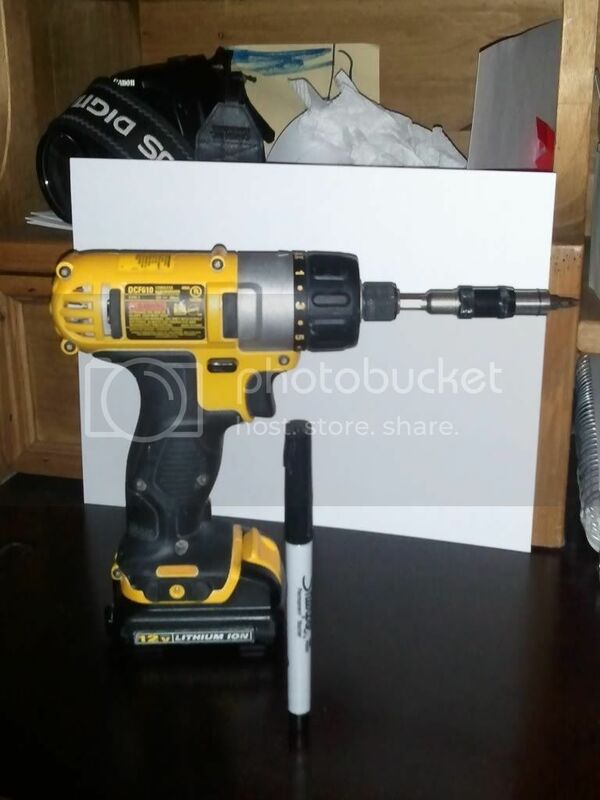 Here is the impact driver I am using. Nice tool. I'm partial to my 12 volt DeWalt impact. Very happy with the power so far. The beauty with the Li-Ion batts is the duration of the time the damn thing can sit around without losing it's charge. Love it! For the around the house stuff I take care of the 12 V has been more than powerful enough, super tiny and ergo too.